When your truck requires repair, maintenance, or service, you want it handled by experts who realize how important it is to get vehicles back on the road. 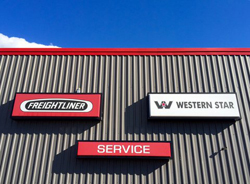 Baltimore Freightliner-Western Star’s Service Department knows trucks and the trucking business. What sets us apart from the other truck repair facilities in Maryland is our Express Assessment – when you bring your truck into our business, or it is dropped off via tow truck, we will see the truck and diagnose the problem within two hours of receiving it. This will give you a general idea of how serious the problem is, and how long the repair is going to take. The service shop facilities at Baltimore Freightliner-Western Star are state-of-the-art, and with 20 service bays, we are able to provide quick service and repair. All of our mechanics are manufacturer certified, and we continue to send them to factory training courses on a regular basis. This investment pays off when your truck is experiencing a mechanical problem that is keeping it off the road. 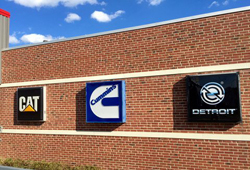 We are familiar with all of the major brands of diesel engines and transmissions. The manufacturers certify our mechanics, and we have a full team of diesel engine technicians to work on your truck’s motor and transmission. In addition, our relationships with these manufacturers provide us with access to factory engineers, diagnostics, tools, and software that enable us to make repairs and service that other repair facilities cannot. Towing Service offered by Ted’s Towing (410-325-6700). If your truck is broken down in Maryland, the surrounding states or for after hour support, we are proud to partner with Ted’s Towing (410-325-6700). Quick and professional, this heavy-duty towing service will deliver it to our location. Once it is here, our mechanics will carefully inspect the engine, transmission, and other major systems and components to provide you with an accurate assessment of the repairs needed. Trust your truck or Sprinter Van to the experts at Baltimore Freightliner-Western Star, and contact us today at 410-685-4474 or 800-832-7278. You can email our Service Manager Jessica Levine.